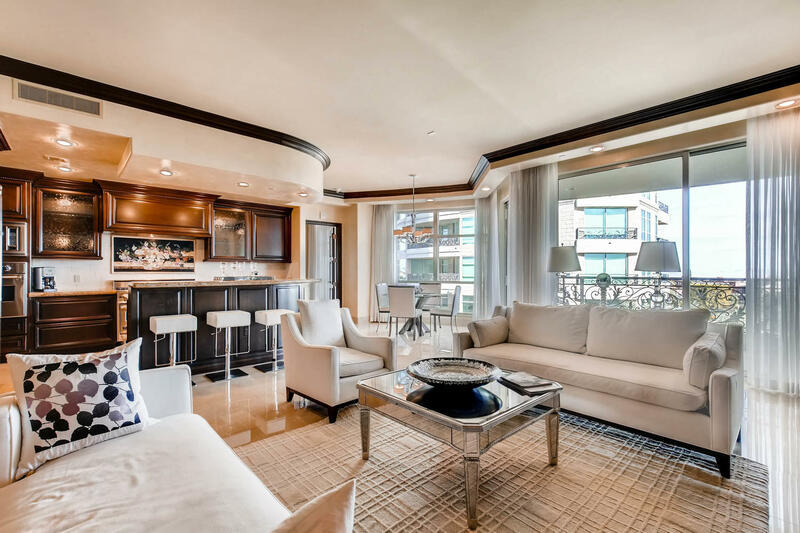 Sophisticated decor and abundant elegance encompass this 2 bedroom gem. 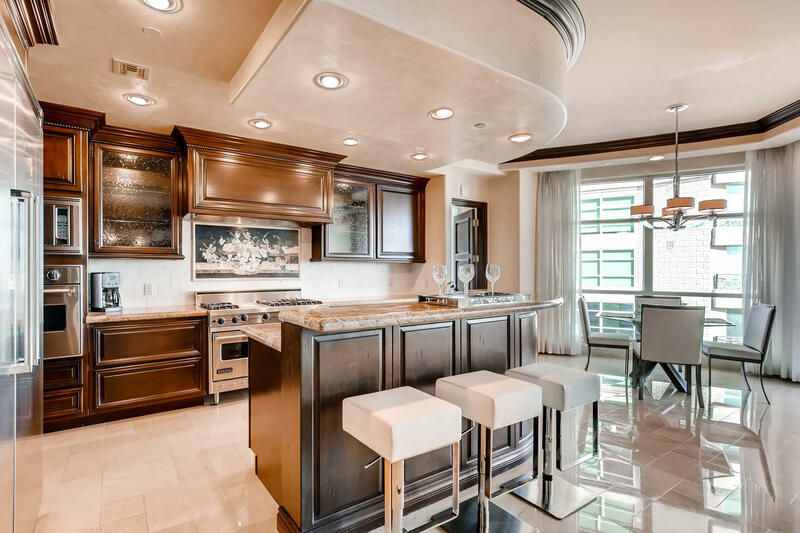 Darkly stained cabinetry, perfectly polished flooring and more can be found in this incredible home at quintessential One Queensridge Place. 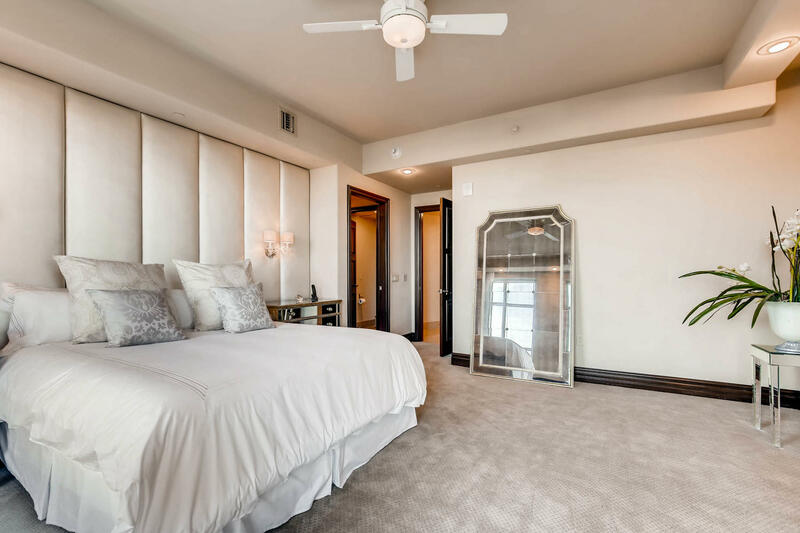 2 bedrooms, 2.5 bathrooms and a stunning den are all at your fingertips from the moment you turn the key to this incredible space. 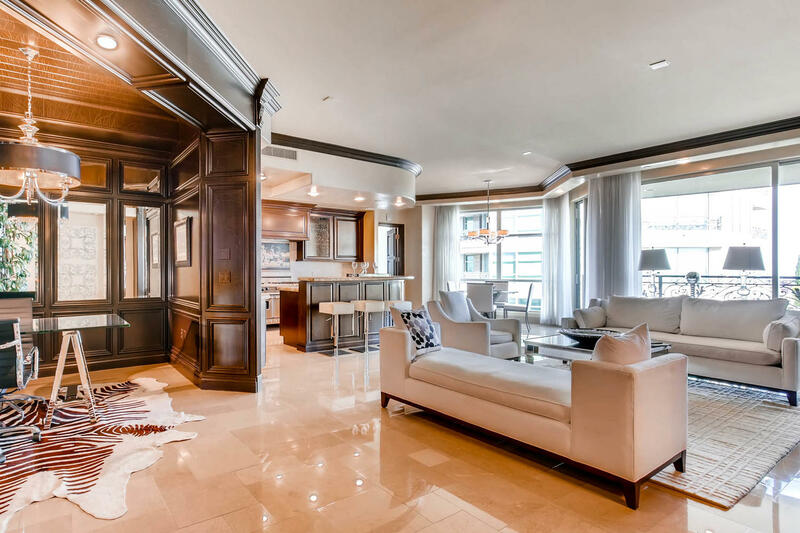 In the foyer lays an intricate hand-laid mosaic of beautiful stone. 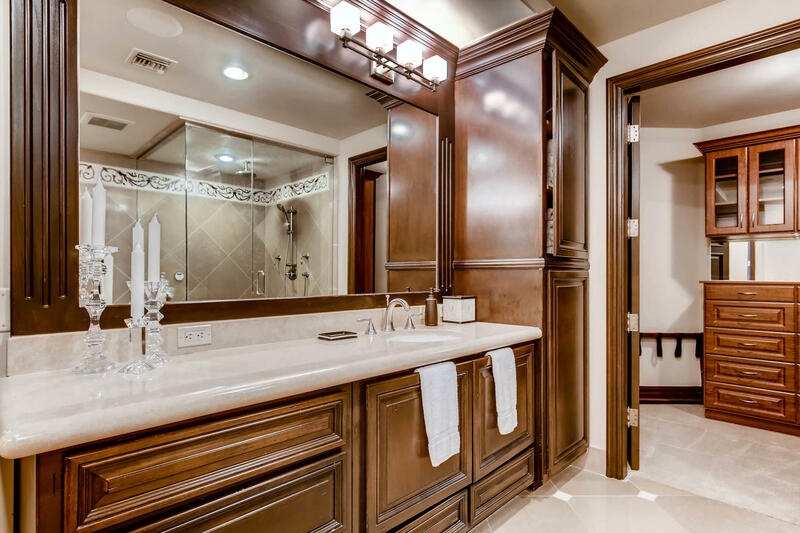 This, coupled with an elegant entryway, sets the tone for this beautiful home. 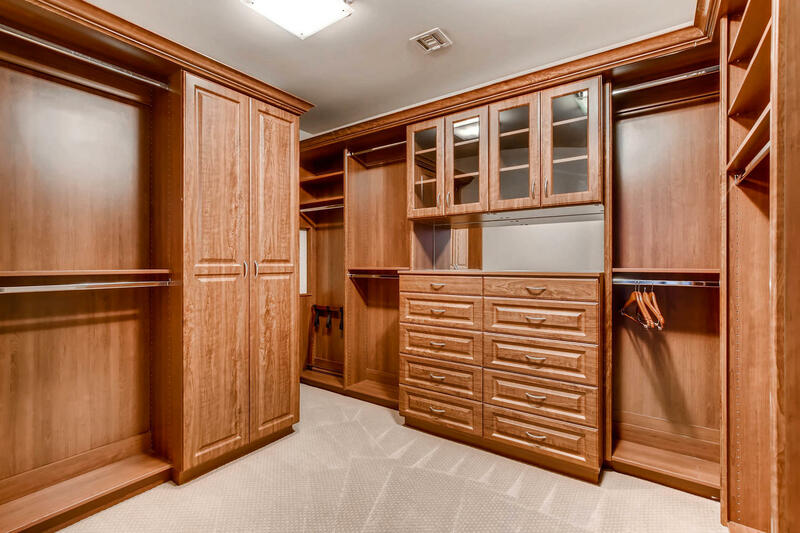 To your left, a custom paneled home office. 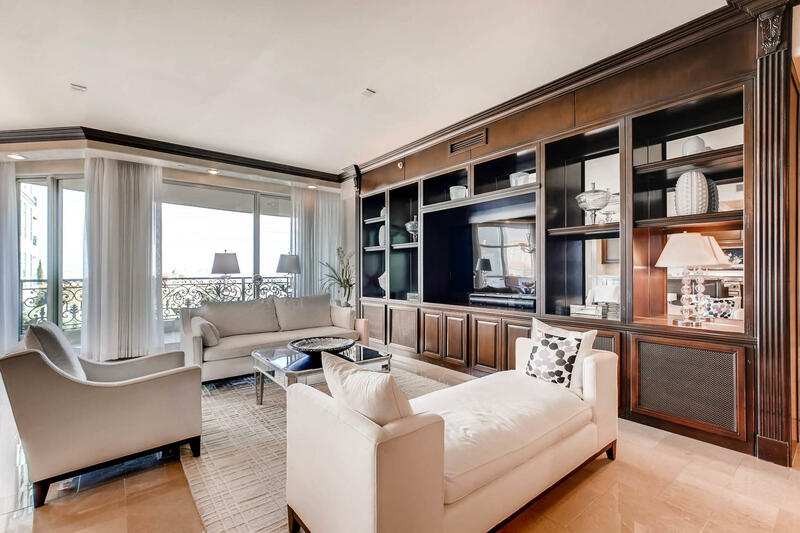 Inset mirrors, timeless lighting and a ceiling finished in wood detail make this an inspiring space to finish last minute work, or unleash your creative energies. A space perfect for every occassion. 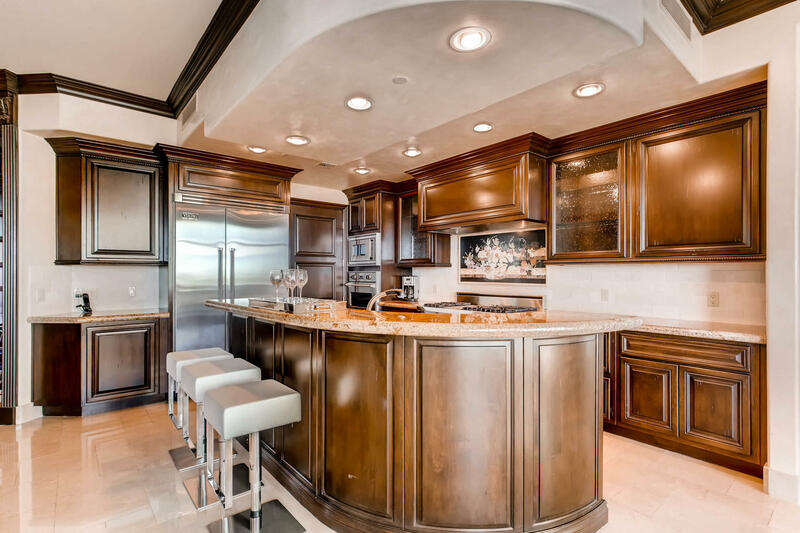 A delightful kitchen boasts beautiful cabinetry, granite countertops and a professional grade appliance suite by Viking. 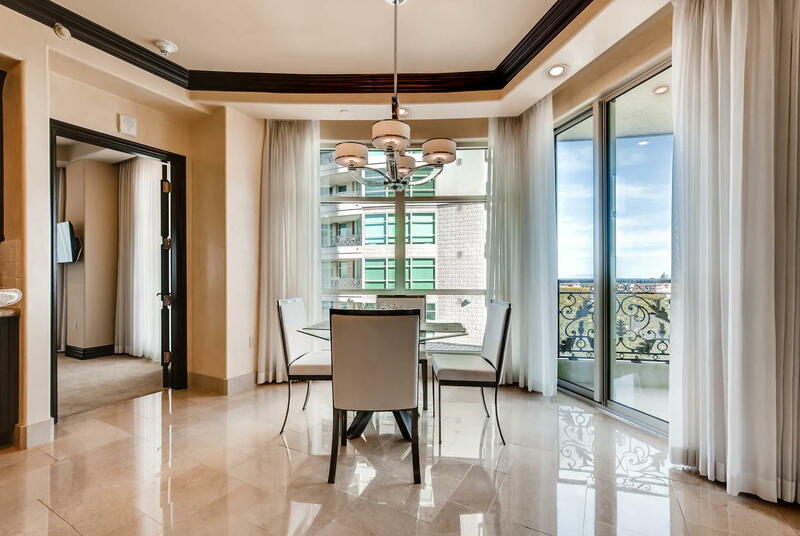 You’ll want to spend every morning in the breakfast nook, with it’s outstanding views and limitless sunlight creating the perfect setting. An eat-up bar offers plenty of seating for in-home dinners or casual entertaining. Complementing the kitchen is the family room. 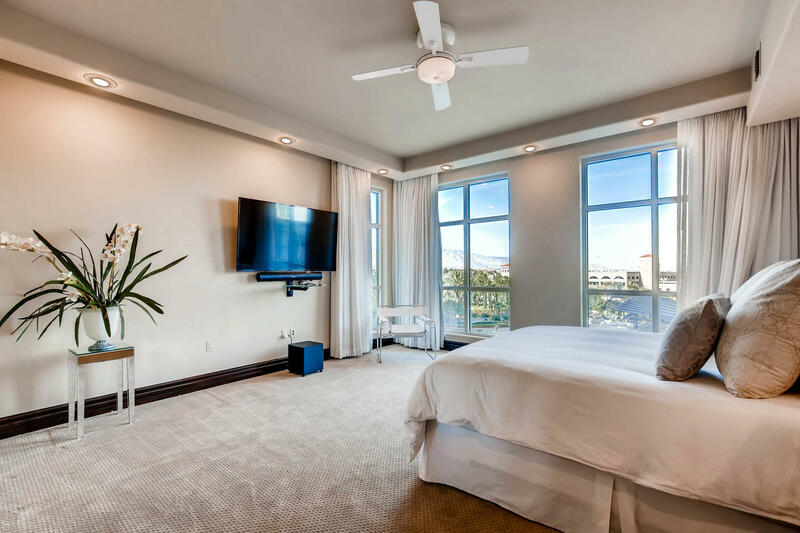 The masterfully finished entertainment center accommodates a large screen TV and offers storage, while large sliding doors bring the outside, in. 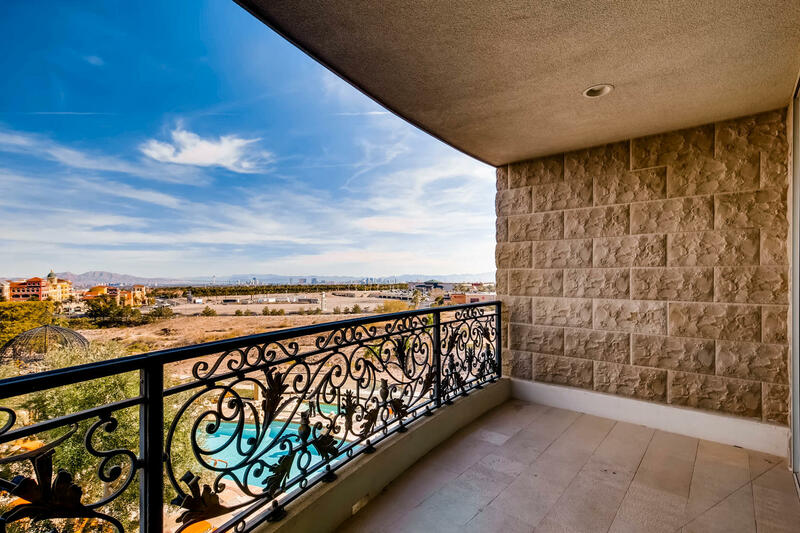 On your family room terrace you’ll take in views of the Las Vegas strip, as well as neighboring Tivoli place. 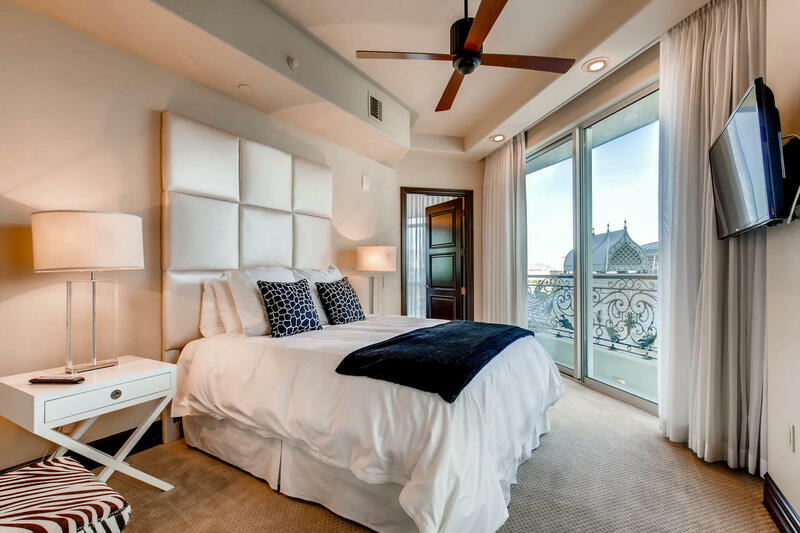 The master suite is the perfect place to retire at the end of your day. 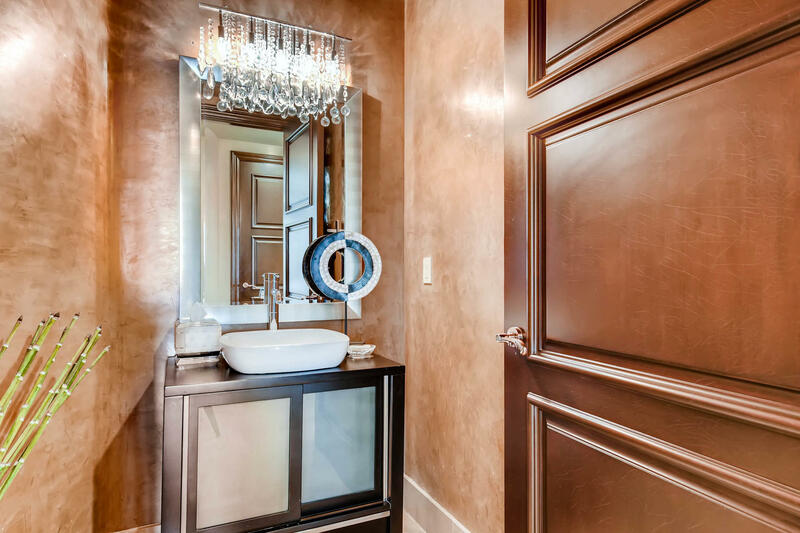 Elegant, neutral wall details and lighting fixtures create a sense of tranquility. 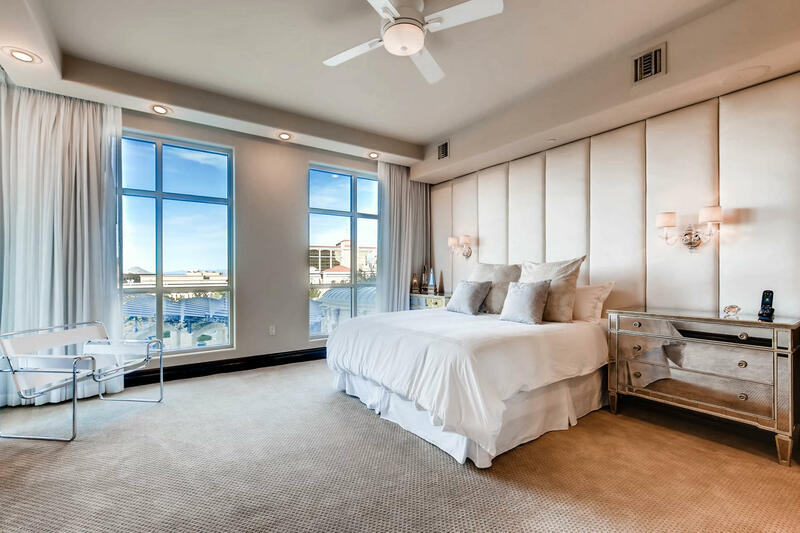 Large windows allow you to take in your surroundings from a rarified elevated position. 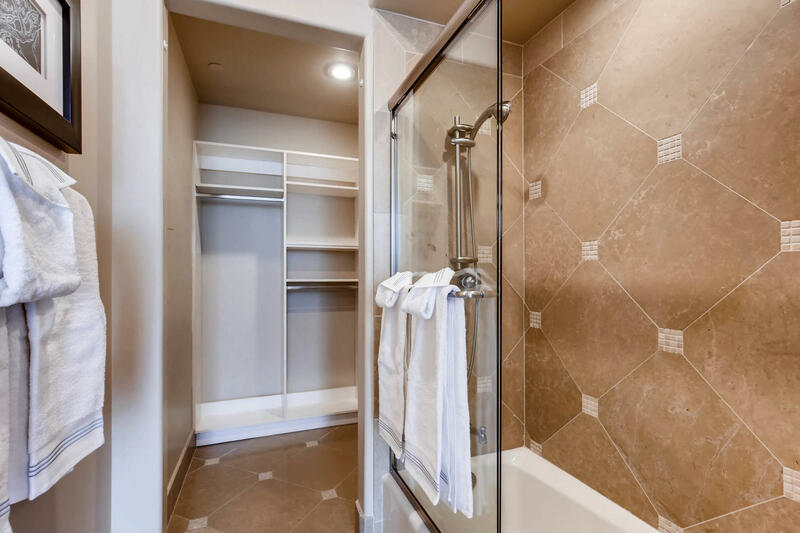 The master bathroom offers a walk in shower, tub, and dual vanity sinks finished in polished stone and milled detailing. 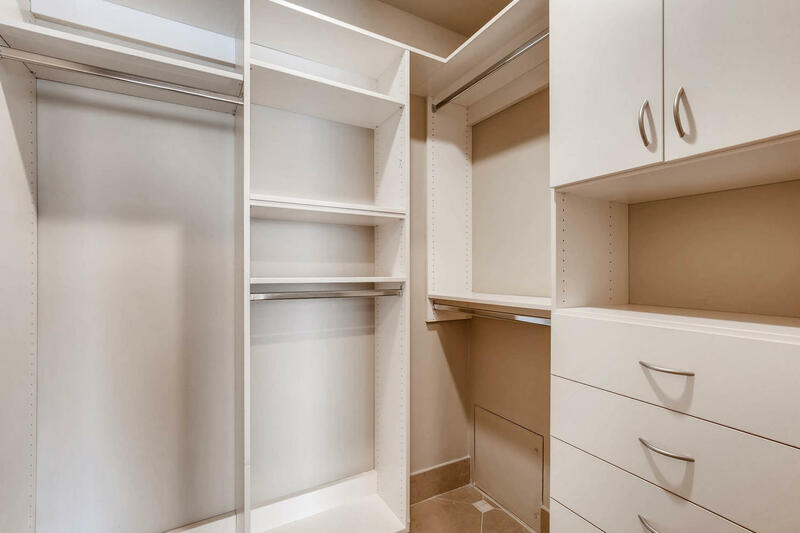 The walk in closet off the bathroom offers drawers, cabinetry and lots of hanging space to accommodate your wardrobe. 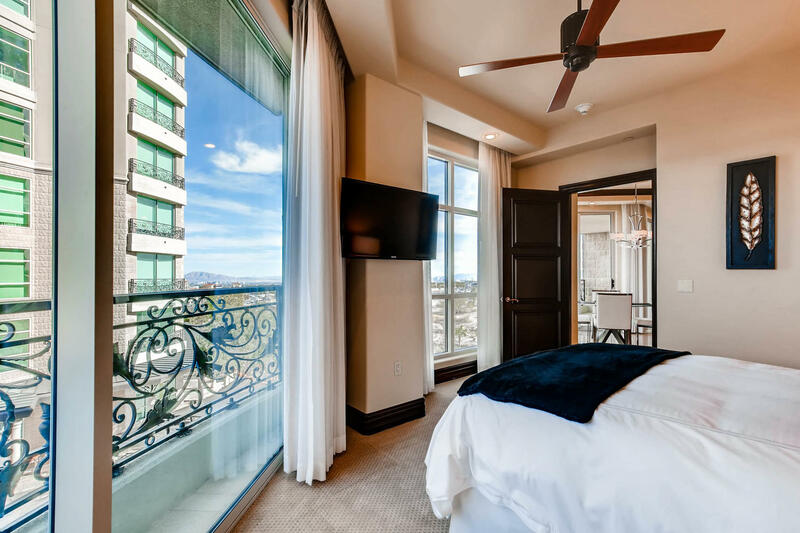 The junior suite makes for an excellent guest suite. Location and One Queensridge Place. 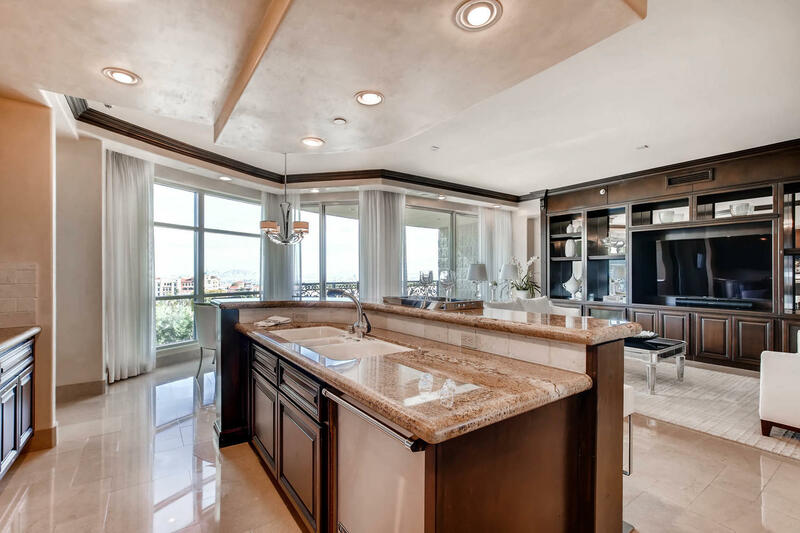 Exquisite details abound in Summerlin’s One Queensridge Place. 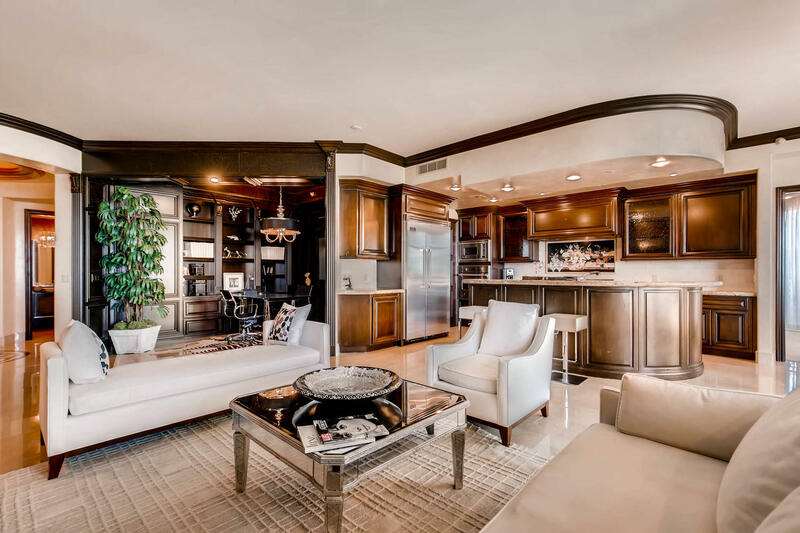 Each of the stunning 219 ‘custom homes in the sky’ within these elegant world-class towers are designed to satisfy even the most discriminating of tastes. 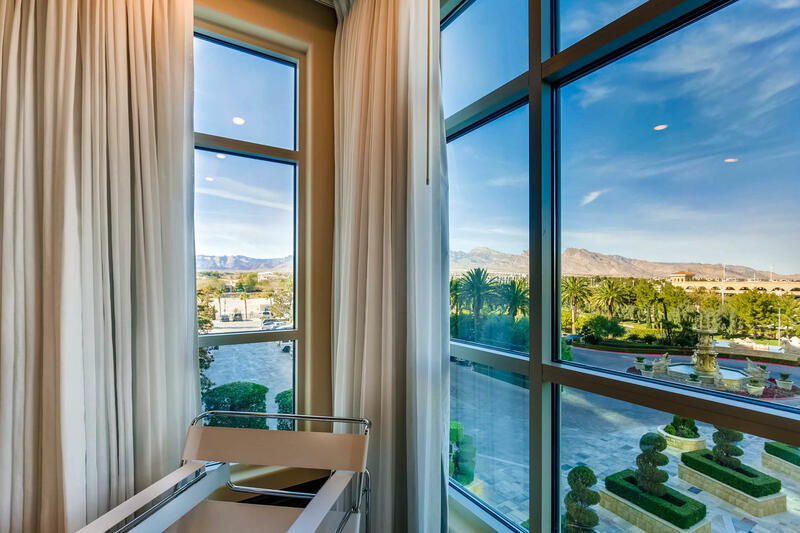 OQP is just minutes away from fine dining and shopping, with Tivoli Place across the way and convenient 2-15 freeway access nearby. Welcome to compromise-free living in ever sense. 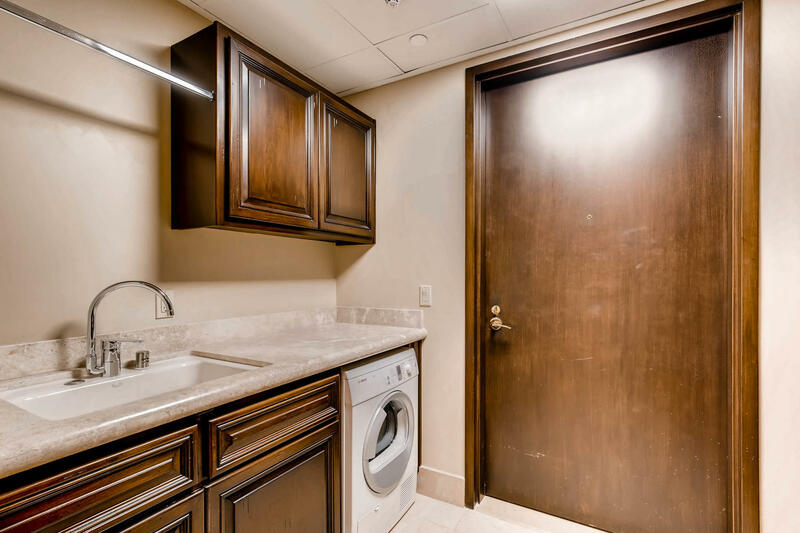 Boasting 24/7 security and valet, attention to detail is made evident from the moment of arrival at One Queensridge Place. 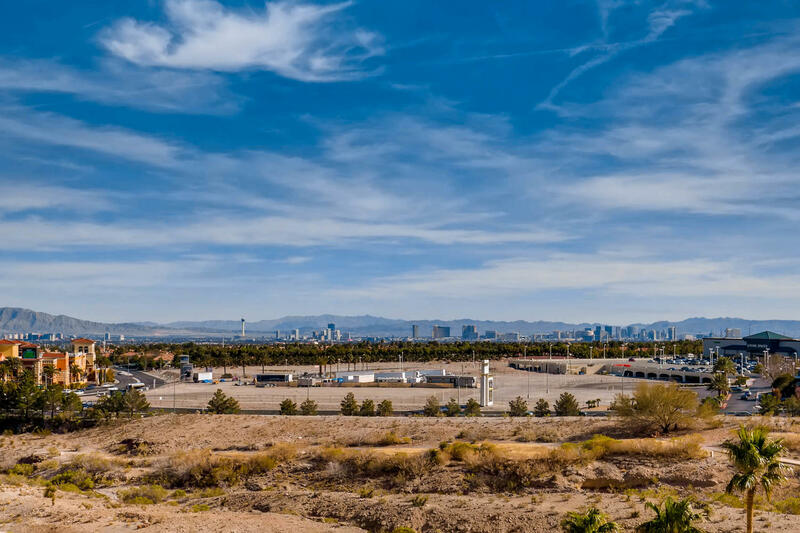 Curated grounds and old-world architecture create an environment unlike anything else in Nevada. 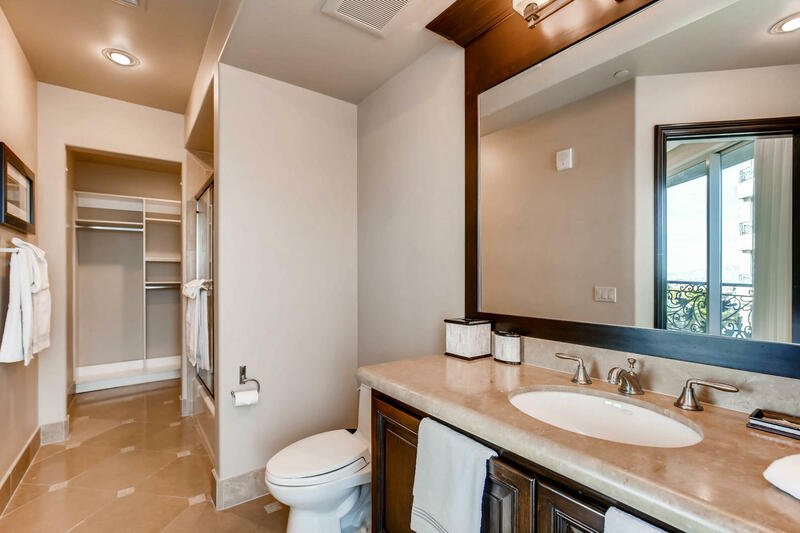 On-site amenities include indoor/outdoor heated pools, a state-of-the-art health center, his and hers spas, and even on-site guest casitas. 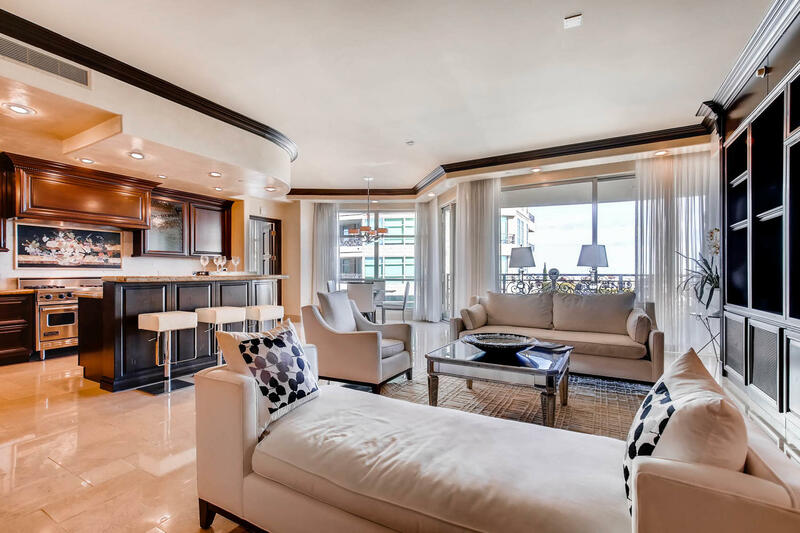 Experience One Queensridge Place and this exceptional two bedroom home today.